GLOBALISATION AND YOU - If you want to be like Jesus, you must have a heart like Him, writes Bernard Thangasamy. COUNTERFEIT REVIVAL - Zac Poonen explains why millions of Christians are deceived by false prophets and counterfeit ‘revivals’. MESSAGES FROM NAHUM - Fredrick Dawson draws vital lessons from Nahum’s prophecies. 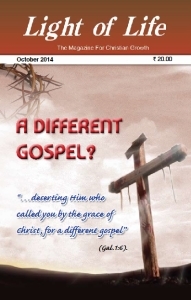 THE CHRISTIAN FAITH - Our faith is proved when we reveal God in our lives, emphasises K. V. Varghese Ampat.